Write all your blog posts. Schedule all of them for the correct day. Visit other blogs and leave them comments. It's that last thing that trips up a lot of people. How do you find blogs to visit? Visit the blogs of everybody who was kind enough to visit my blog and leave a comment. This should be the first thing you do: acknowledge the comment they left, then go visit their blog and leave a comment there. Visit the blogs of everybody who left a comment on my visitors' blogs. As I'm reading and commenting on someone's blog, I look at the other people who left comments there. Some of them are bound to be people who left me a comment, but many others won't be. I give them a visit and leave a comment there. I can keep iterating through this over and over, or I can refer to the daily lists, the theme reveal list, or the original sign-up list. Two things you'll want to remember: you won't be able to visit everybody, and not everything will be interesting to you. There are close to a thousand people who participate in A to Z each year, each with their own interests. If you visit 10% of them over the next month, you're doing really well, and don't feel guilty if the theme isn't all that interesting to you. The goal is to make blog buddies! Remember, you share one interest: you're bloggers. Make new friends and learn new things! Today's post on the Aussie children's writer's theme - E is for Hazel Edwards! Commenting on my commenters commenters! Great idea. I've been going to the daily lists, and I'm trying at least one from a category that doesn't really call to me, and hitting up at least 3 new blogs every day, plus my commenters. I'm actually pretty proud of that, even though it's just a drop in the bucket. Excellent tips. I'm glad you included a link to the document with others posts of the same letter. Hi! Thanks for running such an awesome compilation of peoples blogs. I did make a little error by accidentally posting my D link on the E spreadsheet. My blog name is WordCraft. I added it to D but if you could be so kind as to remove it from E I would be very grateful. Thanks again for all your hard work! Sorry to be anonymous, my wordpress login isn’t syncing to the site right now. I am missing the A to Z already, keep up the good work, you;re doing a grand job. I enjoy the crazy 6-degrees of commenting on commenters commenters! Thanks for the daily encouragement!! Great advice. After the first day of the Challenge I have so many places to visit and comment on that I rarely look at the master list. Thank you for the reminder to visit, and comment on new-to-us blogs over the course of this challenge. To me, this aspect is one of the most exciting parts of A - Z. Although I am new to the challenge this year, I have already met some great bloggers whom I plan to follow regularly! I really like your iteration idea of commenting. At the moment, I'm barely keeping up with the people who are commenting on my posts, but I'll have more time over the weekend to visit more blogs. Thanks for reiterating this. 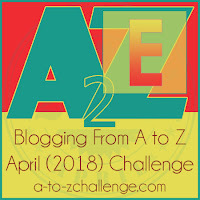 One of my frustrations with the A to Z participants (in the past) has been their not visiting or commenting back. I decided to run an alphabetical monstrorium in my blog. Here is my entry for E: "E is for Elemental", in which I tell you about this type of creatures.